How well do you manage disagreements with your boss or other superiors? How skillfully do you resolve conflicts with people you manage? As a leader, how do you get subordinates to share their ideas for innovation and problem solving –– when they know you might not see eye to eye? Winner of the 2016 IACM Outstanding Book Award! The International Association for Conflict Management honors the authors of a book that has made an outstanding contribution to the field of negotiation and conflict management. 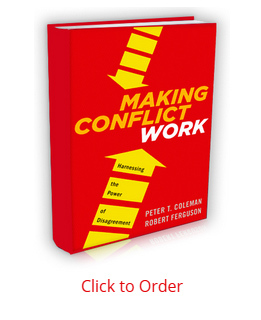 This year’s award was presented to Peter T. Coleman and Robert Ferguson’s Making Conflict Work. Even if you’re great at all of the above, we’re here to challenge you: You can do better. Don’t just manage conflict. Don’t just resolve it. Put it to work. Make it add value to your organization. Conflicts – especially up and down the hierarchy of power – can impair information flow, problem solving, innovation, adaptation, health and morale. Or, they can work for you. Skillfully handled conflict energizes problem solving, inspires innovation and leads to bottom-line effectiveness. This book gives you the strategies you need for making conflict actually benefit your organization and your career. There is no shortage of stories about executives and managers who abuse their power, or employees who overstep their authority, and the resulting conflicts that drag teams and entire organizations into downward spirals toward failure. This book gives you what you need to prevent or correct such toxic trends. Making Conflict Work explains the pitfalls of power and conflict, and what to do to avoid them –– and how to take full advantage of the potential for change that accompanies them. It offers seven new strategies and dozens of tactics for finding greater satisfaction and success at work. This book can help anyone who finds themselves in conflict with someone in authority – bosses, executives, regulators, police officers, professors, and parents to name a few – or in conflict with someone over whom they have authority. Join Peter T. Coleman, Columbia University Professor and Director of the International Center for Cooperation and Conflict Resolution, and Robert Ferguson, psychologist and executive coach, on an expedition of practical discovery of how to make the most of your power, and turn conflict into a strategic advantage. Columbia University Professor Peter T. Coleman is a world-renowned expert in the field of conflict resolution; researching, writing, practicing and teaching on it for over 20 years. His work as a scientist, educator, mediator, and organizational conflict consultant set the stage for Making Conflict Work. Robert Ferguson has practiced psychology and executive coaching for twenty years, and is associated with Raleigh Consulting Group in the Research Triangle region of North Carolina. He helps executives, managers, and entrepreneurs resolve conflicts and effectively influence individuals and teams.